I did another lunch investment pitch roundtable today, this time the topic was "Impact of Technology on Communication and Stocks". I was already looking into the recent news/print spinoffs, so I decided to squeeze them into the topic and pitch the whole basket. 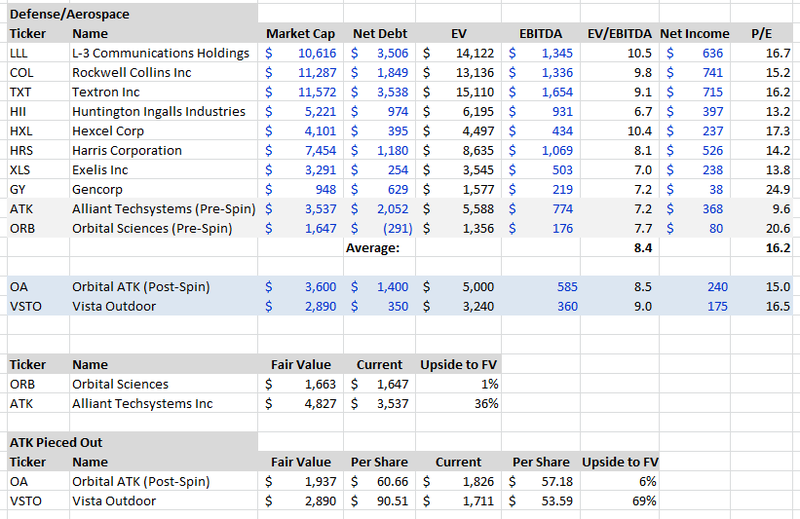 Below is my deck with some commentary, outside of News Corp and New Media Investment Group, I've only looked into these spins at a surface level, so some numbers might be completely wrong. But the sector seems attractive as its bottoming and figuring out the correct corporate structure, digital strategy and industry dynamics to survive. The first quote from David Carr of the New York Times came from his column "Print Is Down, and Now Out" published on 8/10/14 after the announcement of Gannett's newspaper spin. His column and this quote sum up the consensus view of the newspaper industry, it's ugly, unwanted, and destined for red ink in the digital age. However, news and content is still valuable, it just needs to be more tailored to its audience. A (digital) subscription to The Wall Street Journal is virtually a requirement for anyone in finance or a senior management position in corporate America. On the other end of the spectrum, community newspapers are the only news source for many small cities and can provide valuable targeted advertising. 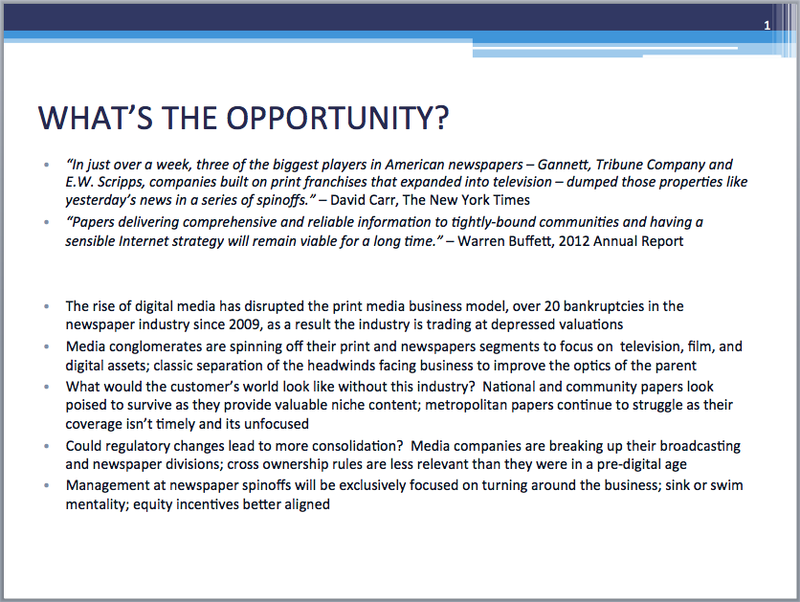 As for the spinoff dynamics, most newspapers have been essentially hiding within otherwise growing media conglomerates, by exposing the print business, management will be forced/incentivized to adapt their product to the current marketplace. 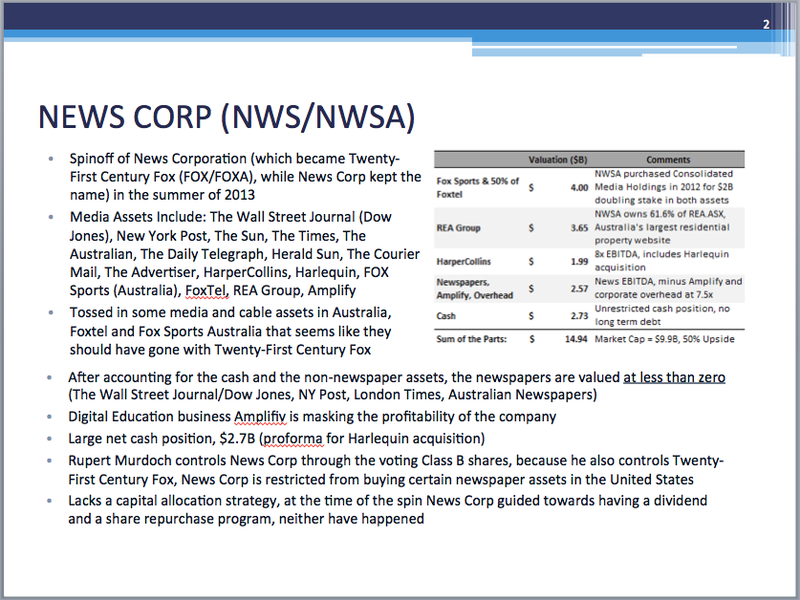 There's nothing really new in this slide compared to my post on News Corp nearly a year ago, but REA Group's market value continues to rise, Harlequin was added, and hopefully Amplify is closer to wider acceptance. One minor complaint, the quarterly conference calls sound like management is telling a story rather than a business update, makes the lack of a clear capital allocation plan even more of a concern. But it's clearly cheap. 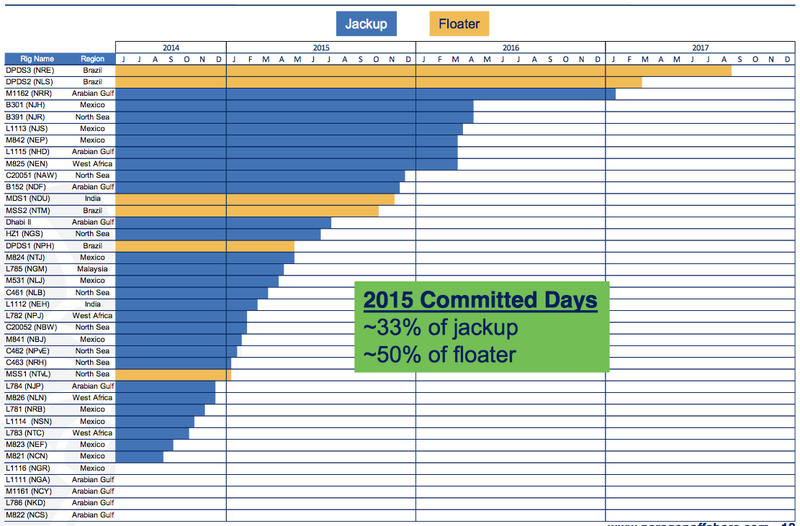 This is another update slide for blog readers, I'm still on the fence about New Media, like the strategy but I remain concerned about the third party management agreement and how that might be bought out or internalized. Fortress is a savvy shop, and they've executed on the plans they've laid out. 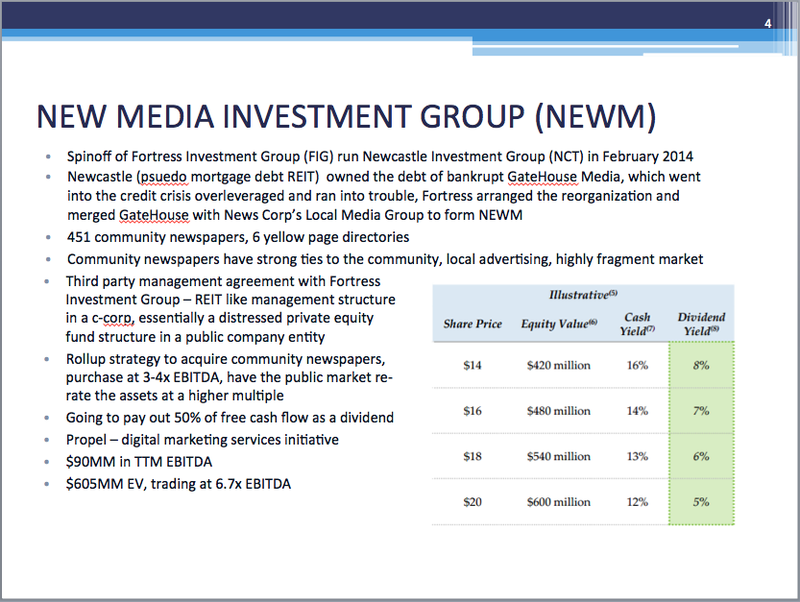 Their quarterly presentations are transparent, a little promotional, but it clearly presents the investment thesis and should net investors high teen returns as they buy local papers cheap and they're rerated in the public markets. 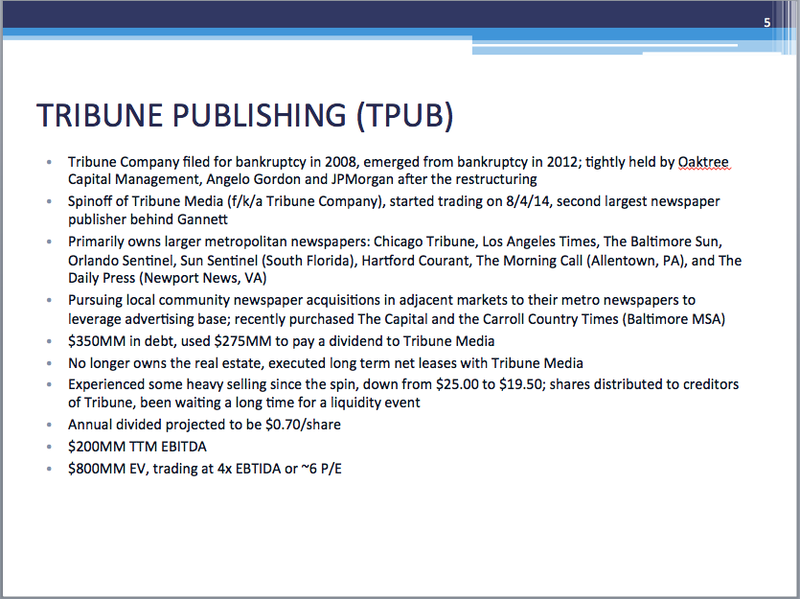 Now we get to recent spins, Tribune Publishing is the riskiest of the bunch, its leveraged and doesn't have the benefit of its real estate assets. Its papers are primarily large metropolitan newspapers, a segment that's similar to a JCPenney's in the retail space, stuck in the middle without a loyal customer base. 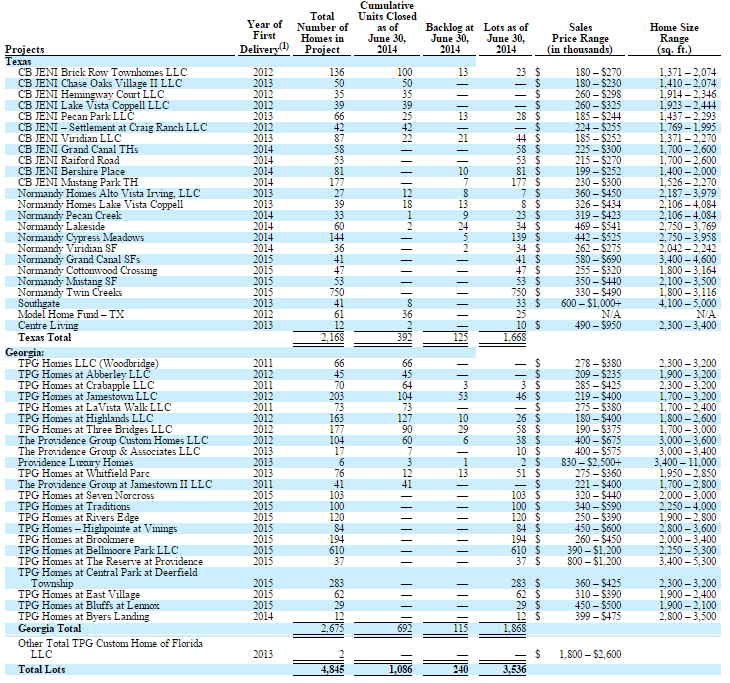 However, its very cheap and has a lot of upside if turned around, parent Tribune Media emerged from bankruptcy about 2 years ago and former creditors (unnatural holders) might be taking advantage of the liquidity of an NYSE listing and selling. The newspaper spins really picked up in the last two weeks, Gannett announced they were going to spin off the publishing business earlier in the week. I don't know the exact timing of the filings, but Carl Icahn curiously filed a 13D after the spin was announced, suggesting the spin. There might be some upside left, but this transaction is well publicized and pretty straightforward. The more interesting transaction is the "double spin/double merger" of E.W. 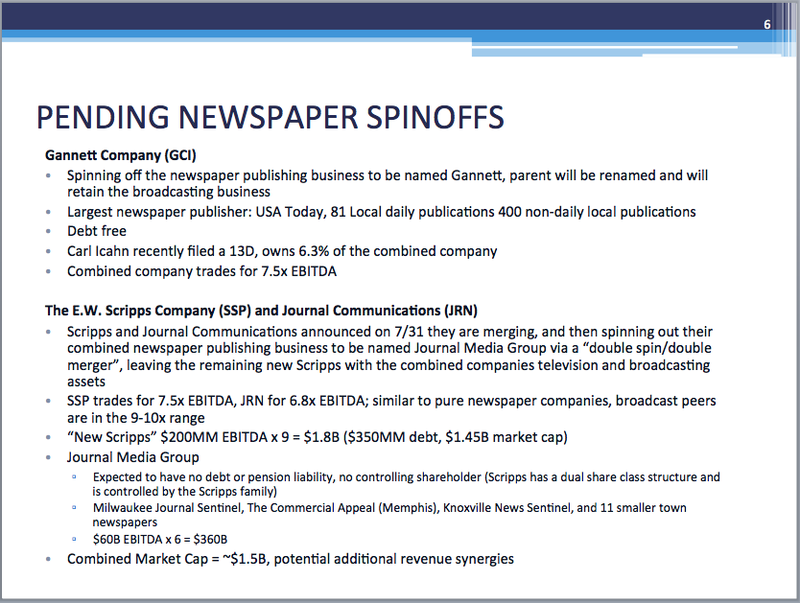 Scripps and Journal Communications, where both will combined their TV/radio broadcast divisions and then spinoff their newspaper segments into a new company to be named Journal Media Group. Both companies would be free of cross-media ownership rules and could therefore pursue acquisitions in markets they were restricted from as combined broadcast and print companies. 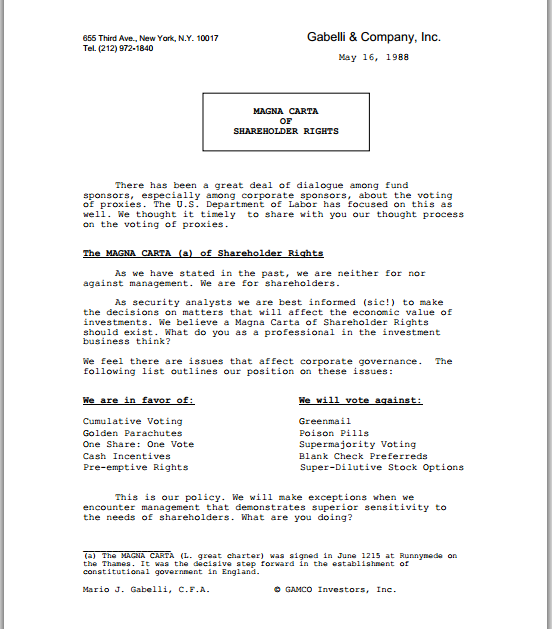 Today the two companies have a combined $1.5B market cap, if you take management's guidance of $200MM EBITDA and use a 9x multiple (low end of comparable broadcast companies due to radio exposure) the "new Scripps" is worth roughly the current market cap and you get the Journal Media Group newspaper business "for free". It's a complicated transaction that won't close until sometime in 2015, and there are more merger details including a $60MM special dividend to Scripps shareholders, but with more consolidation in both industries likely, it initially appears to be an attractive deal for both future companies. Each of the recent spins are a little different, but as a group they should outperform the broad market over a 2-3 year time. I could also see regulations relaxing in this space, newspapers/radio/local TV entities aren't as influential as they once were, encouraging more consolidation. He's an active alumnus of the Columbia Business School (interviewed in the Fall '11 copy of Graham and Doddsville), good to get a little Dodd/Graham philosophy reminder every now and then. Exelis Inc (XLS) is an aerospace and defense contractor that was originally spun off of ITT Corporation (ITT) on 10/31/2011, and now Exelis is following suit by spinning off its shrinking mission systems business line into a new company called Vectrus (VEC) later this summer or early fall. This is the classic move to separate the declining business to highlight the attractive remaining business. Exelis will be more of a pure play aerospace and defense products contractor focused on a few select growth sectors. Vectrus will be a government services defense contractor with falling revenues, but strong cash generation due to the low capital requirements and a variable cost structure. Exelis benefits by shedding the underinvested services business which is experiencing severe declines in revenue due to budget constraints and the draw down of troops in Afghanistan. 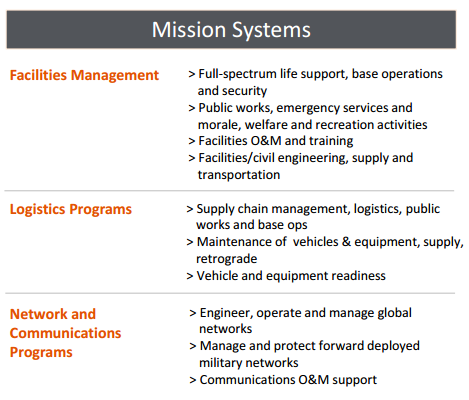 The mission systems business is weighting on the rest of the business and masking the improved growth profile of Exelis's C4ISR segment and other growth initiatives, giving the remaining business a higher multiple. Vectrus is similar to other recent spins in the government services space (Engility Holdings & SAIC), declining revenues in the near term is less of a problem than it appears due to the low fixed costs, most of their costs are variable and attached to specific contracts. 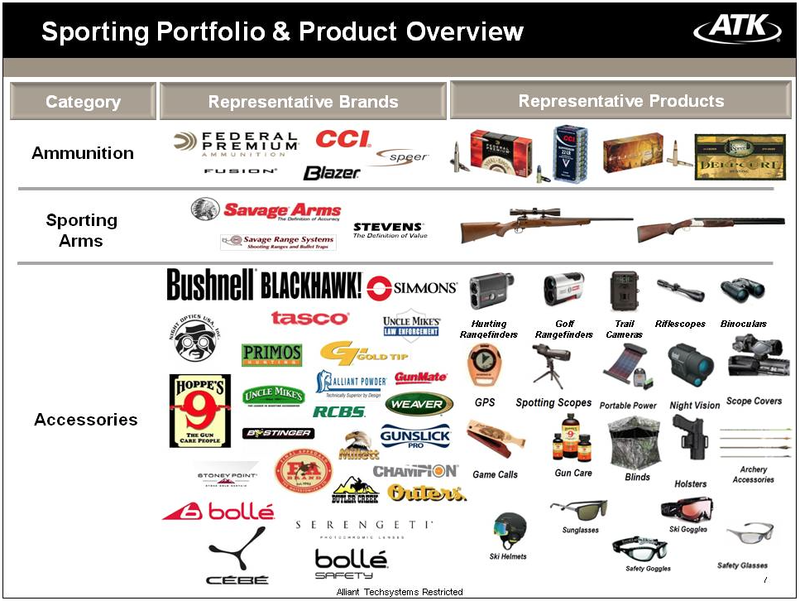 With increased geopolitical tension defense contractors could once again see their revenues pick up from cyclical lows and Exelis represents an attractive event driven way to invest in that theme. At the time of the Exelis spinoff from ITT, mission systems was the growth business and the rest of the business was flat or declining, times have certainly changed. Shortly after the spinoff from ITT, defense spending came under a microscope with budget sequestration and the draw down of troops in Afghanistan. In 2013 Vectrus had $1.5B in revenue with 100% of that coming from the U.S. Federal government, a full 92% from the U.S. Army, and 34% of 2013 came from Afghanistan which is quickly going away. 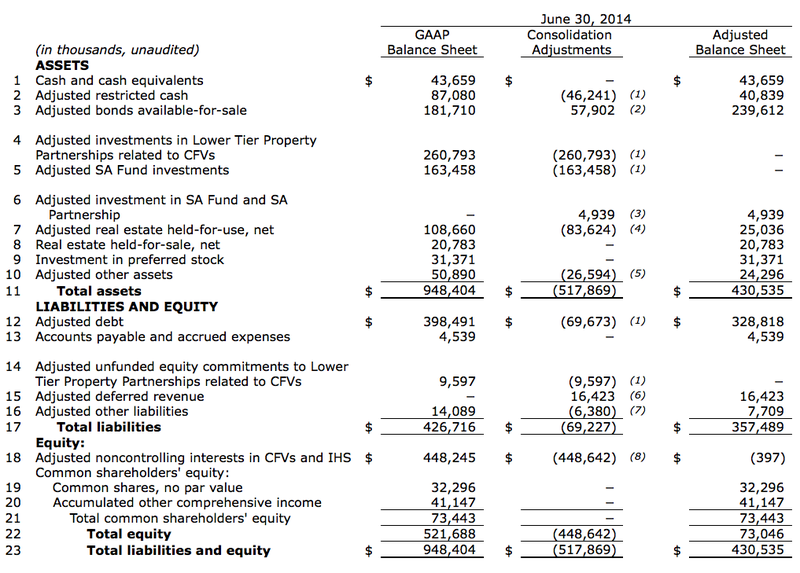 Revenues are expected to be down 25% in the mission systems business in 2014, with additional downward pressure in 2015. Vectrus will operate in three main business lines: base operations (majority of the revenue), logistics, and network communications. Operations, Maintenance and Defense of Army Communications in Southwest Asia and Central Asia (OMDAC-SWACA) contract: Network communications contract expiring in 2018 supporting the O&M of the Army's largest network from locations in the Middle East. Kuwait based Army Prepositioned Stocks-5: Logistics contract storing and supporting a wide range of military equipment and supplies. Despite the industry headwinds, Vectrus can be an attractive business due to its low working capital requirements, much of their employment base are subcontractors attached to single contracts, as the contracts wind down so does a lot of the expense base. 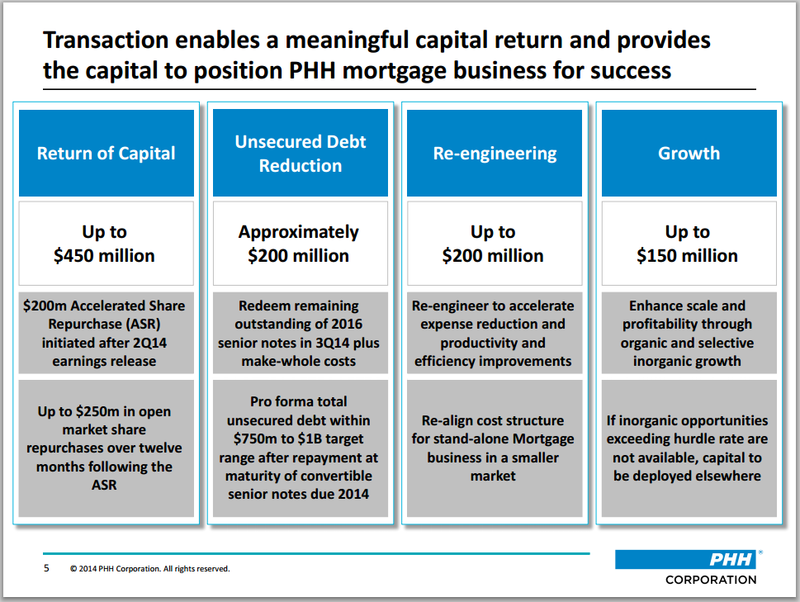 Operating margins aren't great, at 4.0-4.5%, but with a renewed strategic focus on the business (classic spinoff reasoning) there will likely be some additional restructuring and cost cutting in the months after the spin is completed. Leading Vectrus will be Ken Hunzeker, he has been the president of the mission systems business going back to the ITT/XLS spin, and is in for a nice raise. Slightly more interestingly, Lou Giuliano will become the Chairman, he's the former Chairman and CEO of ITT and ran what would become Exelis at ITT for 8 years before becoming the President and COO of ITT in 1998, so he's intimately familiar with the business and the defense industry cycles. Like many spins, Vectrus will be take out debt in order to pay a dividend back to the parent, here they're targeting 2.5-3.0x EBITDA, or approximately $130-150MM (although that's been a moving target down recently). Government services businesses generate a lot of cash, I view debt (as long as its reasonable) as a positive here, management will likely be focused on paying down the new term loan and potentially refinancing to a better rate once the company becomes more seasoned. Vectrus should have EBITDA of $50MM in '15 EBITDA, assuming they max out the debt at the 3x range, and putting a discounted 7x EV/EBITDA multiple on it gives you $200MM in market cap, a small slice of the $3B combined Exelis market cap. I would imagine there will be some selling once the spin appears in Exelis investor's accounts as it will be a small unwanted orphan (it's worth about $1 per XLS share), so one strategy would be to wait for the spinoff to occur and settle out a bit before snapping up Vectrus shares on the cheap. Exelis has identified four "Strategic Growth Platforms" in which they want to focus and invest going forward: (1) Critical Networks; (2) Intelligence, Surveillance and Reconnaissance Systems & Analytics; (3) Electronic Warfare; (4) and Composite Aerostructures. 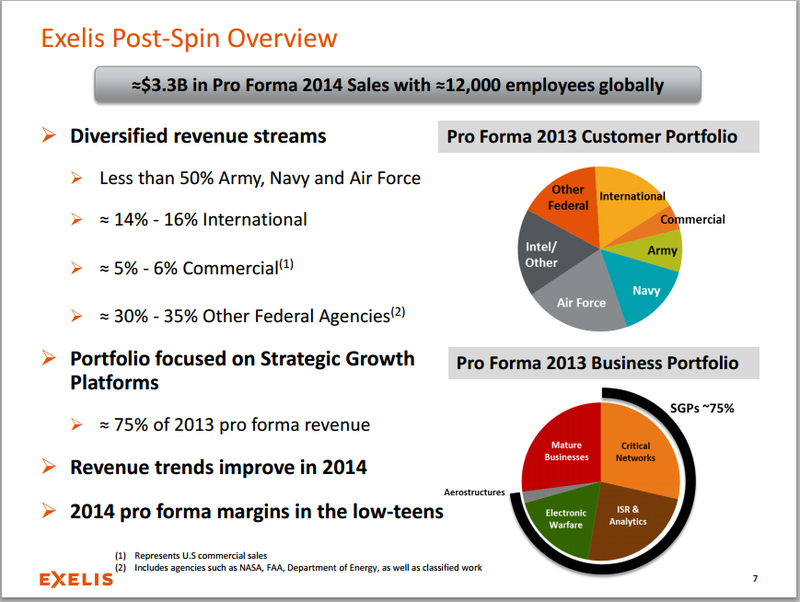 The Vectrus spin allows Exelis to appear more attractive to investors, post-spin it will have higher margins and a diversified revenue base less focused on the Department of Defense. While top line revenue is down double digits YoY for the combined Exelis, the majority of the decline is the Vectrus business while the rest of Exelis is mostly flat with growth expectations going forward that should deserve a higher multiple. When Exelis was spun off of ITT, many called it a pension plan with a defense business attached to it, and that would have been a fair assessment. Exelis has made significant progress on the pension (~$1.3 billion unfunded position as of the last 10-Q) and will retain and continue to service it after the spin. The company has also frozen the pension plan of all future benefit accruals effective December 2016 and expects it to stop needing to make additional contributions to the plan after 2017. Continued low interest rates have plagued companies with large pension plans because it lowers the discount rate at which a defined benefit plan calculates its future liability. The lower the discount rate, the more current assets the plan needs to meet the future pension liabilities. Tucked away in a transportation and student loan bill (MAP-21) was a pension funding relief provision that is likely going to get extended, it will reduce the amount Exelis will be required to contribute to its plans in the next several years from $225MM annually to $150MM. This gives time for interest rates to normalize (bringing the discount rate up) and may reduce the overall contributions necessary by Exelis. Vectrus will be paying Exelis a dividend of ~$150MM upon the spinoff giving the parent company amply liquidity when you consider the unused commercial paper program and credit facility with very little net debt. Exelis anticipates maintaining their current quarterly dividend (2.5% yield), and could return additional capital to shareholders with their share repurchase program. 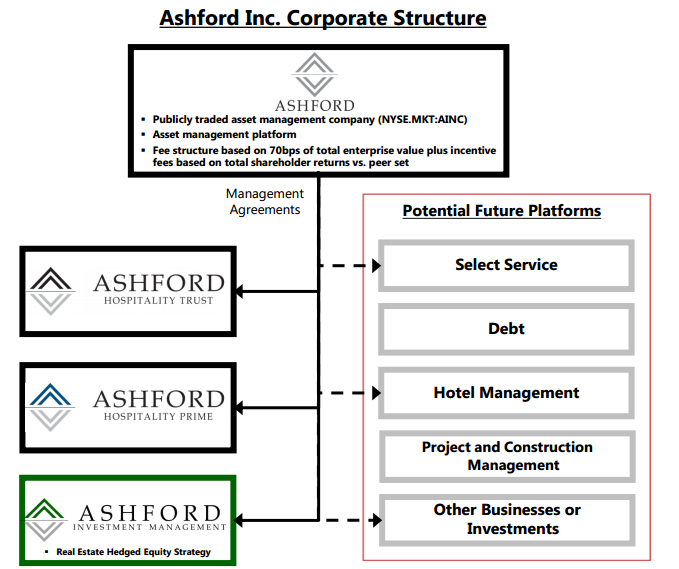 The flexible balance sheet also allows them additional room to invest in their Strategic Growth Programs and bolt on some smaller acquisitions like they recently did with the Orthogon airport management business. To value a post spin Exelis I added the $1.3B pension liability to the net debt, along with the $150MM dividend from Vectrus, subtracted out the $50MM in EBITDA that Vectrus is expected to earn in 2015 and then added back the pension contribution to EBITDA. If Exelis were to be valued at 8x this adjusted EBITDA measure, I come up with a ~$24 price target for the remaining business. Add the additional $1 for Vectrus, and the combined business is worth $25 per share versus $16.41 at today's prices. Greater than expected headwinds in the Vectrus mission systems business, especially in their major Afghanistan and Iraq contracts. Continued political pressure to reduce military and defense spending, although temporarily out of the headlines, the budget deficit is still substantial and unsustainable. Exelis has a large unfunded pension liability in comparison to its market cap, if interest rates stay flat or decline it could force Exelis to make additional pension contributions above current projections. Additionally, Exelis is assuming an 8.25% rate of return (down from 9.00% in 2012) which could turn out high given current elevated asset prices. 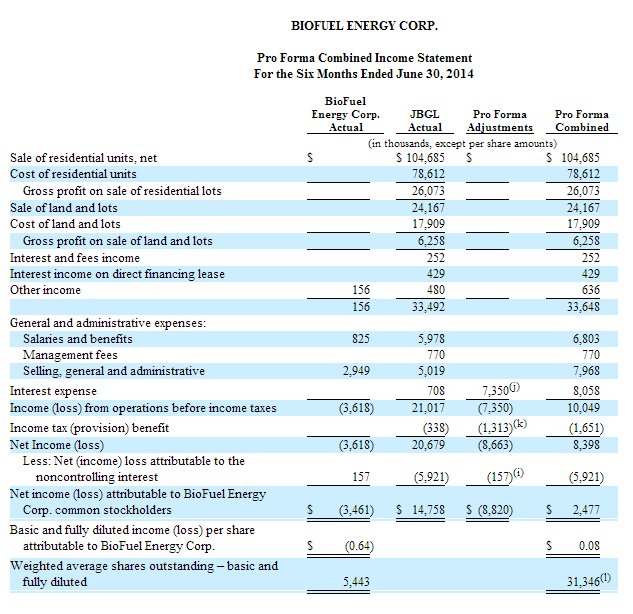 The spinoff was guided earlier in the year for "Summer 2014", but has now slipped into summer/fall, further slippage or cancellation of the spinoff would reduce the attractiveness of Exelis, but it still remains an undervalued company in its current form. With the defense industry near a cyclical bottom, the spinoff of the Vectrus mission systems business provides an attractive event driven investment opportunity by creating a higher growth products business and a headwinds facing services business. 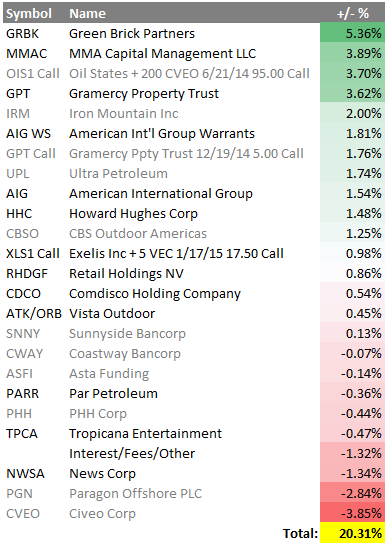 I'm initially going with a Joel Greenblatt like call option strategy to enter a postion, the spin will expose value in both the parent and the orphan, but I'm extending it out with a January expiration to allow Vectrus a little time to find a following in the investment community. Depending on where Vectrus trades after the spinoff, I may pickup some additional shares at that point.